Oxley Wild Rivers National Park contains Wollomombi, which is the highest waterfall in NSW. The easiest access is via the Apsley Gorge which is 20 kilometres east of Walcha, off the Oxley Highway. Apsley is 150 kilometres west of Port Macquarie. A 4WD vehicle is required for access to Riverside, Youdales Hut and East Kunderang Homestead and you\'ll also need a permit and key - contact the park office for more details. Riverside and Youdales Hut require a 4WD vehicle with low range gearing - no trailers. The most extensive 4WD tours that can be undertaken in the park is a trip to Mary\'s View. There are two ways of going about this and the first is to travel along the Waterfall Way, then take the Armidale Kempsey Road to the village of Willawarrin, then turn right onto Carrai Road. 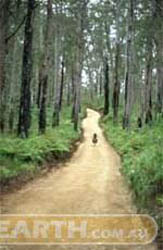 Follow Carrai Road to Kookaburra, then follow Carrai Road to the right, and follow the signs to Mary\'s View. The second is to drive to Walcha, then travel east along the Oxley Highway, and follow the signs to Werrikimbe National Park along Kangaroo Flat Road. When in Werrikimbe National Park, follow the Racecourse Trail to Coachwood Road, then to Kookaburra and Carrai Rd, and follow the signs to Mary\'s View. Which ever way you decide it will take at least 7 hours return, not including stops for lunch. 4WD vehicles are essential, and take care as the roads are narrow, winding and can be slippery in the wet.